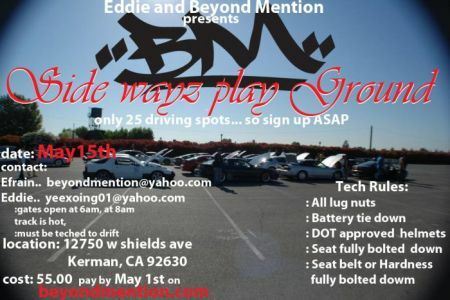 May 15th eddie and Beyond Mention drift event!!! will have tandem drifting!!! MUST SIGN BEFORE MAY 1st!!!!!! beyond mention is kicking off the 2011 with the first drift event in the central valley!! will be the first event in all the valley that will have allow tandem drifting!!! Re: May 15th eddie and Beyond Mention drift event!!! will have tandem drifting!!! Yup, Lemoore duders checking in! anyone got any videos or pics of the event??? ^^^^ what he said!.. i want to see some too !!!! I had a blast guys. Thanks for setting up te event! ^^^ GREAT times, and a pretty sick spot. Look forward to hoping to seeing everyone next weekend!